This work was the first sustained philosophical study of psychic phenomena to follow C.D. Broad's LECTURES ON PSYCHICAL RESEARCH, written nearly twenty years earlier. The author clearly defines the categories of psychic phenomena, surveys the most compelling experimental data, and traces their implications for the philosophy of science and the philosophy of mind. He considers carefully the abstract presuppositions underlying leading theories of psychic phenomena, and he offers bold criticisms of both mechanistic analyses of communication and psychophysical identity theories. 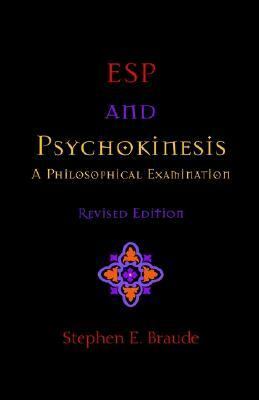 In addition, he challenges the received view that experimental repeatability is the paramount criterion for evaluating parapsychological research, and he exposes the deep confusions underlying Jung's concept of synchronicity.Braude, Stephen E. is the author of 'Esp and Psychokinesis A Philosophical Examination' with ISBN 9781581124071 and ISBN 1581124074. Loading marketplace prices 124 copies from $28.92 How does the rental process work?